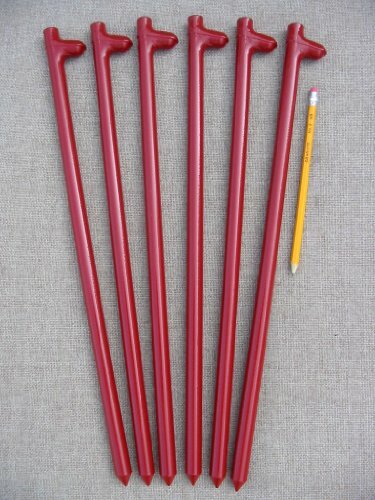 A six pack of steel stakes. These are the most heavy duty 18" long stakes on the market today. Forged rope hook style head with a precision machined point. Baked on Red enamel finish. Great for tents, canopies, bouncers, inflatables and moonwalks. Great for Tents, Inflatables and Bouncers! A "Best Seller" to the Rental Industry! Made in East TN...ships same day!